Start module Create a new portal General settings / Click on "Next" and continue to "Database server"
Start module File menu / New portal General settings / Click on "Next" and continue to "Database server"
Portal menu / Import portal General settings / Click on "Next" and continue to "Database server"
Portal Builder General settings / Click on "Next" and continue to "Database server"
Displays the database type of the available database servers. To use the MySQL driver, the line wrapper.java.additional.7=-Dde.uplanet.server.store.mysql.enable=true must be added to the block # Java Additional Parameters in the supervisor.wcf file in the installation directory /cfg. Before doing this, close the Portal Manager and then stop all Intrexx services. Afterwards, make the changes and restart the Intrexx services. Displays a description of the database type. 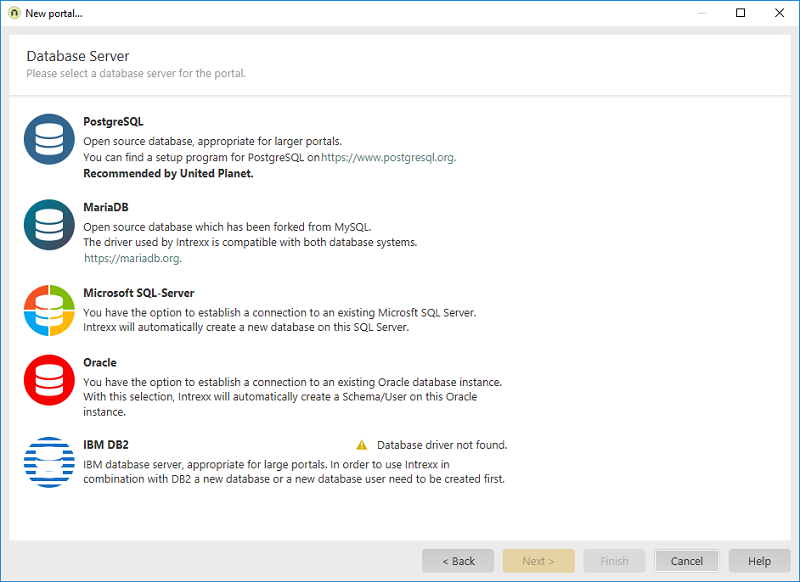 If drivers are not available for a database server, a notification will appear when you Click on "Next". Not yet installed drivers can be installed retroactively by re-performing the setup. The subsequent dialogs, where the connection to the database server is defined, vary depending on the database type.